CDTA owns and operates the Rensselaer Rail and Saratoga Springs Train Stations, two of the Capital Region's gatweay facilities. If you are coming to the Capital Region by train or traveling somewhere by train, find vital information about directions, parking and public transportation options at these rail stations. Easily accessible by CDTA bus or vehicle, the CDTA Rensselaer Rail Station, which opened in September 2002, is the 9th busiest station in the country, serving more than 800,000 people each year. The spacious 20,000 square-foot public lobby features a waiting area, ticketing, baggage handling and customer amenities such as a coffee shop, bookstore and a U.S. Post Office. High-level boarding platforms eliminate the need to cross tracks, ensuring passenger safety and convenience. A multi-level parking garage adjoins the station, providing covered, secure parking. These CDTA buses serve downtown hotels, office buildings and government centers. The top deck of the parking garage abuts the main entrance to the station and serves as a drop-off/pick up point for customers. Limited, free short term (1 hour limit) parking is available. Two levels of parking below the main plaza offer space for 500 cars with covered access to the station. Well-lit and secure surface parking for 600 cars is located on the north side of the facility, just off East Street. 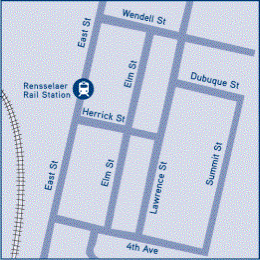 From north, south,east, or west, the Rensselaer Rail Station is easy to reach. We are centrally located near the major highways in New York State. The Capital District Transportation Authority (CDTA) is the owner and operator of the Rensselaer Rail Station in Rensselaer, New York. The station opened in September, 2002. 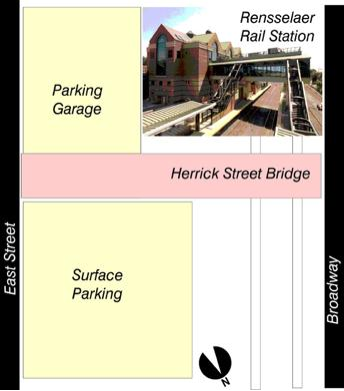 There are several components to the rail station, including the garage. The garage, provides covered and secure parking for rail travelers. CDTA has established a modest rate structure for garage and surface parking. The garage consists of 2 parking decks. A third level serves as a public plaza, which opens to East Street in Rensselaer. The plaza also contains a number of short-term (1-hour limit) parking spaces. The Ground Level contains 260 spaces. 20 spaces are designated for people with disabilities. The garage is operational 365 days per year. 24 hours a day. Parking Customers can exit any parking area at any time during the day or evening. Customers enter the parking garage and surface lots by using the entrance at the north end of the facility. The entry is clearly signed from the parking lot entrance on East Street. All traffic exits at the same location. Vehicles over 8' 0" cannot be accommodated inside the garage. Overheight vehicle parking is available adjacent to the parking garage. For those dropping off or greeting passengers, FREE parking is available for the first hour on the top deck of the Rail Station and for one-half hour in Lot A, Lot B or in the garage. Emergency phones are located throughout the garage and an attendant is on duty 24 hours a day in the Toll Plaza to help or summon assistance should you have a problem. Surface parking lots offer convenience and pricing alternatives that fit the needs of all travelers. DISABLED: Customers pay only $6.00 per day in the garage. Spaces are clearly marked. Official disabled license plates or a valid permit must be prominently displayed at all times. Cash or Credit (Discover, Master Card, Visa, American Express). The automated machines will issue customers a Parking Payment Ticket, which is required at time of exit. Republic Parking manages the parking services under contract to CDTA. Their services include but are not limited to staffing the attendant booth; provide parking and logistic services, revenue and customer service. The facility is an entirely self-parking. Pedestrian flow signs are prominently displayed, making the walk to the existing station easy for customers. Elevators: Are located in the middle of the garage, on its west side, abutting the new station. Stairs: 2 stairwells are available to customers. One is on the Northwest Corner and one is in the center of the garage. The facility provides contract security services 24 hours a day at the building along with a vast network of camera surveillance. The Authority assumes no responsibility for fire, theft or damage to, or loss of a vehicle or its contents. We encourage you to lock your vehicle and remove any valuable contents. Management reserves the right to change or add rules and regulations. Determination of conformance with all rules and regulations shall be at the sole discretion of Management. The renovated CDTA Saratoga Springs Train Station, opened March 2004, serves 24,000 passengers each year, primarily for travel to New York City. 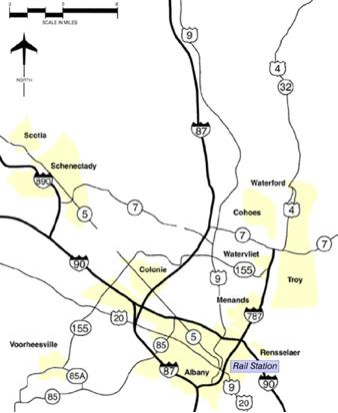 The new station also serves the Empire Corridor with the Adirondack route to and from Canada, and the Ethan Allen route to and from Vermont. 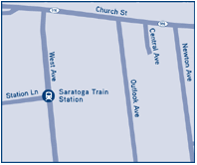 Saratoga Springs Train Station is a regular stop on many of CDTA’s commuter bus routes. With the addition of Greyhound Lines, the station is an intermodal hub providing customers with connections within the region, as well as to destinations throughout the state and beyond. Amenities include canopied entry shelters, vending machine, ATM machine, Free WiFi, information kiosk, and an outside patio with benches and a children’s play area. Tickets for Greyhound and Trailways buses from anywhere in the country. Well-lit and secure surface parking for 80 cars is located on the south side of the facility. From north, south, the Saratoga Springs Rail Station is easy to reach. Saratoga Springs offers big-city excitement with all the comforts of a mountain resort. Visit the natural springs, geysers, and mineral baths that made the city famous, then prepare for high stakes at the internationally acclaimed Saratoga harness and thoroughbred races. Stroll through the quaint Victorian downtown district with its sidewalk cafes, tree-lined streets, and charming boutiques.